12inchSkinz templates are easy to edit in Adobe Illustrator or Photoshop CS3 and above. How to properly design and export your design for 12inchSkinz. 1. 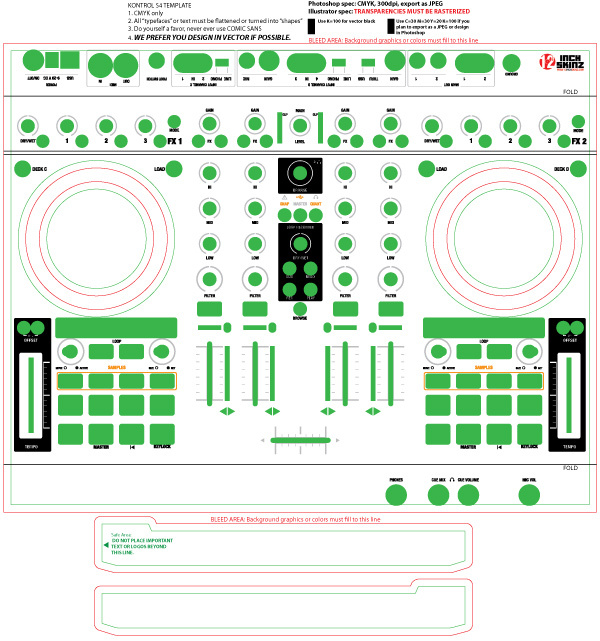 Download template for your corresponding hardware. Open appropriate files in Illustrator or Photoshop CS3+ and you will find individual INFO layers. Design your graphics to OUR specs for the best possible print are included in each file. 2. Exporting graphic for print. Illustrator: Leave info, text, and graphics in corresponding layers. Photoshop: crop graphics to outer BLEED area, DELETE all guides, holes or ANYTHING that is not to be printed and export as 300dpi JPEG under 14MB. All that should be showing in a FLATTEND SINGLE LAYER jpg is the background graphics and (info/kob) text or graphics. If exported properly, your skin should come out looking EXACTLY the way you designed it. If you are unfamiliar with 4/4 color offset printing, reading through this list will offer you some tips and guidelines to help you create your graphic to get the best possible print. If you are familiar with offset printing, briefly browsing through this section will offer some designing tips that are specific for 12inchSkinz. We will assume you are reading this because you have some familiarity with Photoshop or Illustrator. If you have never created a design for commercial printing, then it is very important you know the diffrence between RGB and CMYK. RGB (red, green, blue) are the colors that represent the colors shown on your computer monitor (web graphics). CMYK (cyan, magenta, yellow, and blacK) represents the colors that are printed on paper. JUST like your home inkjet printer, you will notice it requires C, M, Y & K ink cartriges. 12inchSkinz are produced using the same inkjet technology. Graphics formatted in RGB sent to a printer will look dramatically different that what is seen on your computer monitor. 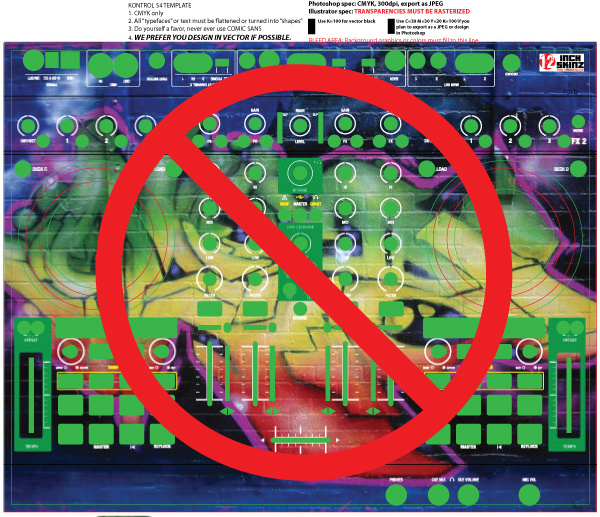 That said, colors shown on your computer monitor do not accurately depict 100% CMYK inkjet colors. IF you stick to CMYK in your design, for the most part, everything will be printed as you imagined. Due to the unique nature of the printing process, the EXACT color and design displayed in web proofs may not be printed on the final product. Be aware when creating your design that we CANNOT print with white ink. 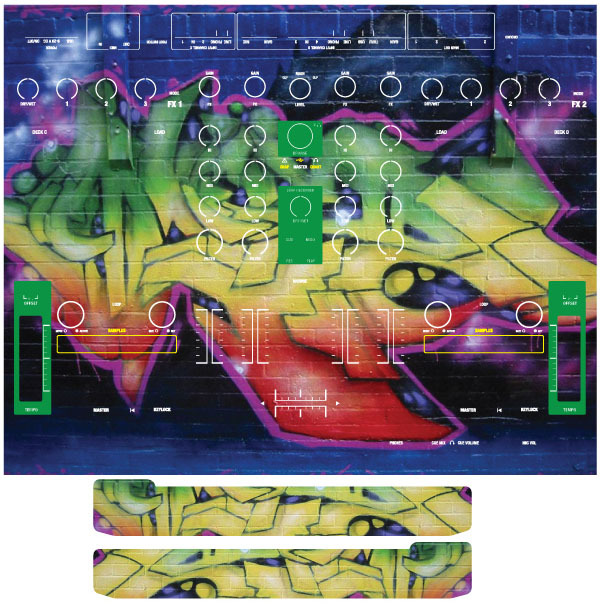 This is important when creating a design if you would like it printed on one of our BRUSHED METALLICS. Whatever you inteneded to be white, will be the color of metallic material you wish to print on. To produce a dark or rich BLACK, it is important to understand RGB black vs. CMYK black. 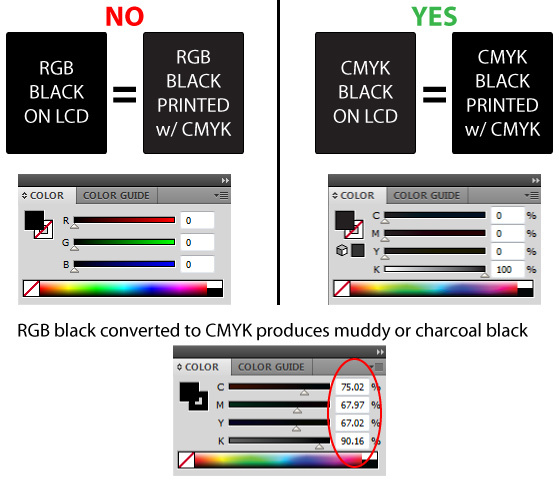 The black you see on your LCD screen is always be RGB even though you are using a CMYK color pallate. RGB color palletes do look more vibrant on screen but will produce muddy or washed colors when printed. A CMYK black will look muddy on your screen but will produce a draker black when it goes to print. Examples of this in the illustration below. Without going into a 10 paragraph explanation of this, we will explain what you need to know to get the best possible print in both formats and why VECTOR is BETTER. Requires less memory, smaller file size. Resolution is not a factor in vector art. You can always scale pixels down, but not up. We cannot print your 130x130 pixel avatar on a 4" record label without it looking pixelated. Vector art will ALWAYS also have more contrast when printed. This may not be true for all printers but specific to the printer we use. Here is a simple image to ILLUSTRATE the difference of scaling vector and a bitmap. Typography is the most essential ingredient to a great design. 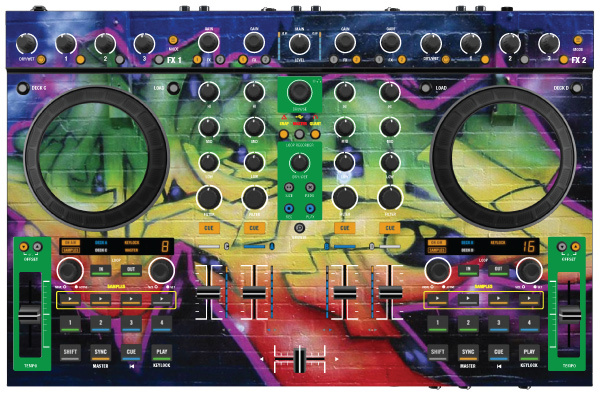 To the non-dj looking at your gear, what do you want them to remember?......YOUR NAME of course. Your gear should be a BILLBOARD to what and who you are. When choosing a typeface (or FONT to the non-professional), you want to not only find something that compliments your design, but is clearly legible. For most of us dj's, we are usually in a dimly lit booth in a club or venue and making your NAME visible should be most important. 12inchskinz may refuse to print your design if the resolution of your design is incapable of delivering a professional print. Often some graphic flaws may be corrected at no expense but more difficult images will require a re-submission of your graphic or a hourly based design fee. We will not proceed with added design fees unless authorized by the client.